Nutrition and Skeletal Muscle provides coverage of the evidence of dietary components that have proven beneficial for bettering adverse changes in skeletal muscle from disuse and aging. Skeletal muscle is the largest tissue in the body, providing elements of contraction and locomotion and acting as an important contributor to whole body protein and amino metabolism, glucose disposal and lipid metabolism. However, muscle loss, atrophy or weakness can occur when there are metabolic imbalances, disuse or aging. 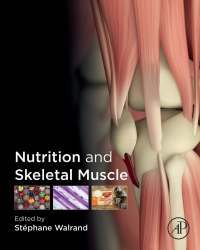 This book addresses the topic by providing insight and research from international leaders, making it the go-to reference for those in skeletal muscle physiology.